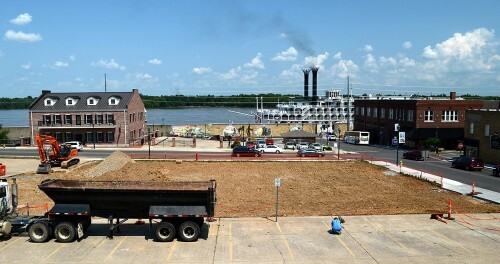 Last summer, I wandered down Broadway to shoot the empty lot where the former First National Bank sat and discovered the American Queen riverboat was docked on the riverfront. While I was trying to compose a photo that incorporated both the boat and the parking lot, I heard a voice from On High. I was pretty sure it wasn’t coming from the former General Baptist Church up the hill, so I looked over my shoulder. The voice came from some nice folks from Texas who had rented the top floor of the Kage House for a brief stay in Cape. They invited me to shoot from the deck attached to the back of the building. I didn’t go inside, but they said it was very comfortable. That’s when I learned the property has been converted to a short term rental property with rates cheaper than a lot of Interstate hotels with a lot less ambiance. In 2008 several of my friends were visiting Dave Hutson and noticed a “for sale” sign on the building at 120 Broadway. 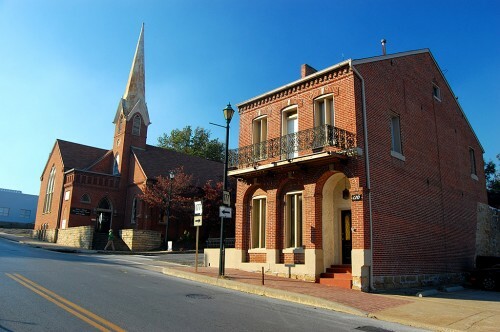 As a kid driving with my parents on Broadway to shop on Main Street, I was always intrigued by two buildings, the second being what I later found out was named the Kage House. A short time later my family and I took procession of the latter of the two. We do not live in the house but use the apartment on the second level as a place to stay when we visit. We also do short-term rentals to out-of-town guests. I considered it to be a diamond in the rough, and after a few years now it is slowly starting to sparkle. It has not only been a fun hobby for the last three years renovating the building (my wife keeps telling me to find a less expensive hobby) but also has given me a chance to connect with some old friends and have made some great new friends in the process. What is an interesting feature of the house? The land was once owned by Louis Lorimier, who in turn passed it down to his daughter. At a later date it was sold for 300 gallons of whiskey. This is for sure one of the most intriguing features of the house as well as the methods in which the building was constructed. Living in Europe for 10 years and spending a great deal of time in New Orleans had given us a chance to see many buildings that were hundreds of years old that are still standing tall and will still be there in hundreds more. The Kage House, I am sure, will be one of those still standing long after I am gone, as it possesses some of those same quality traits of construction, built with only brick, stone, timber and steel. My parents lived in the upstairs apartment for awhile when they were newlyweds, back around 1941. Across the street from the Kage House was Barks’ Restaurant where my parents ate a lot of meals (Mom always asked Mrs. Barks to “save” her one of the pork chops) when they were on the menu. I really enjoyed seeing this. Thanks. Par Gas was co Jamie Estes owned in the 1980s-1990s. Kaggie House was his offices. I used to call on Jamie there upstairs. Secretaries downstairs. Was not impressive then just make shift offices and file drawers. Out side was as beautiful as ever. My parents also lived there for a few months after they married in March of 1941. Our family and Barks family were good friends for years. Thanks for the great memories. I just have a question. Is there actually paper work supporting the claim that the building was sold for 300 gallons of whisky. If so what? I only commit history by accident, so the only reference I have is The Missourian’s interview with the owner, Keith Diebold. I have seen the property abstract wherein it reads that it was sold for x units (barrels?, gallons?, don’t remember) of whisky. It was in the Barks family for about 40 years. I lived with parents Max & Lee, and brother Harley Dean in the apartment above the Right way Cafe immediately across the street. My younger sister Linda (Barks) Jenkins still lives in Cape. The last Barks family to live in Kage house was my aunt Mildred Benson and husband Gene, until mid to late 60’s. My wife, Pam Spindler, and I will be staying there when we return to Cape for the wedding of niece Olivia Jenkins to Ryan Kaullen. Appreciate all the remembrances. Terry Barks.